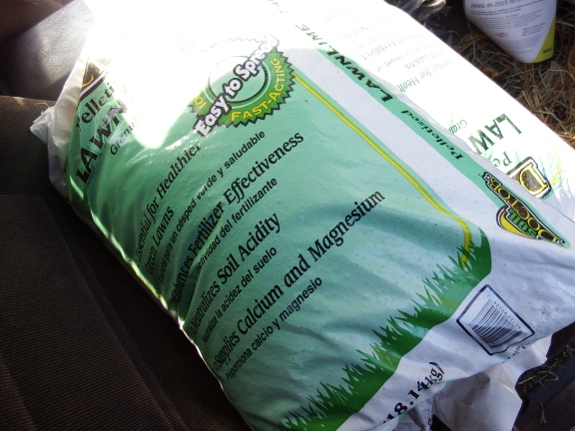 If you're thinking of adding lime to your garden, be sure to select the right kind --- dolomitic if your soil needs a boost in magnesium as well as calcium or non-dolomitic if your soil (like ours) is already too high in the former mineral. Unfortunately, our local feed-store clerks have no clue what I'm talking about when I ask for non-dolomitic lime. Poor Mark had hefted all three of these bags onto the ATV in preparation for carting them back to our core homestead before he noticed the error. Next time, maybe I'll break outside my hermit patterns and go along to help him select the proper minerals.